Please note that Neutrik has come out with an all new higher capacity NL4FX. It fits all the connectors that the FC does it will just handle more power and larger cable gauges. It looks cooler too! Our 1/2 inch (12mm diameter) 3-to-1 heat shrink. Perfect fit for all of Speaker cable applications. Our 1/4 inch (6mm diameter) 3-to-1 heat shrink. Perfect fit for our 4E6S & GS-6 cable applications. Neturik NC3FX female 3 pole xlr microphone cable connector, female. Nickel housing and silver contacts. Efficient design using only 4 pieces and NO set screws. Very good cable strain releif. Neturik NC3MX male 3 pole xlr microphone cable connector, female. Nickel housing and silver contacts. Efficient design using only 4 pieces and NO set screws. Very good cable strain releif. 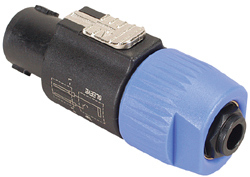 Male to Male 4 pole lockable coupler for Speakon Cable connectors. The NL4MMX will link two NL2/4`s together for cable extension. 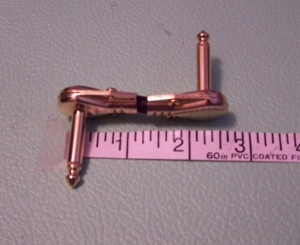 PCNS Flat RA is our very own Flat Right angle gold plug. These durable plugs and well constructed and excellent sounding. These plugs will help you save space on your pedal board allowing you the opportunity go put more pedals on your board! Check out our Patriot PBX pedal board cables link if don't want to solder them yourself or to get some ideas for how you can route your cables on your board. Neutrik Speakon NL4FX. Directly compatable with all NL4MC panel mount connections. These connectors are awesome, they will hanlde 50amps and up to 10 gauge cable! These are Cable mounted connectors. 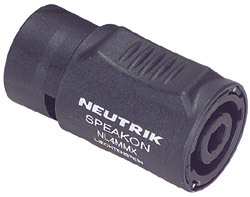 Neutrik's NA4LJ adapter goes from 1/4" female to Speakon. Nice compact way to convert 1/4" to Speakon.